Jesus is the model of perfect humility, and punishment for pride is built into the very order of God’s creation. Jesus told us, “Whoever exalts himself will be humbled; whoever humbles himself will be exalted” (Matt. 23:12). It is essential to understand why pride is so dangerous to the life of the soul — why it has been considered the most dangerous of the seven capital sins. Pride was the sin of Lucifer and the fallen angels, who said, “I will not serve.” Pride was the sin of Adam and Eve, who wanted to be like God and to decide for themselves what is right and what is wrong, without reference to God. This pride resulted in disobedience and sin, thus bringing pain, suffering, sickness, and death into the world. Pride is that exaggerated self-love that inclines us to see ourselves as superior to others. It is that insidious desire for self-exaltation that leads us to seek our own honor and glory apart from the honor and glory of God. Pride sees the self as the center of the universe, the measure of all truth, and the standard of all morality. Pride sets itself in opposition to God’s wisdom and will and encourages one to see himself as the judge over God’s Word and God’s law. Pride will always seek to have its own way, to control, to dominate, and to manipulate. It is the source of endless self-deception, vanity, and folly. Through it comes the lust for power; thus, it is the catalyst of anger, violence, and war. It is an affront to God, an open door to the devil, and the gateway to Hell. And if we let pride rule our lives, it will always be a disaster in the making, because, no matter how confident we might feel, it will always backfire on us in the end. There’s only one antidote for pride, and that’s humility. The tendency to pride is overcome only by its corresponding virtue, humility, which is the root of all virtues. For all of us, there is a simple rule in the spiritual life: Where there is no humility, there can be no merit in your good works in the sight of Almighty God, and therefore there can be no sanctity. Pride, though it may be secret pride in the form of selfishness and ulterior motives, will cancel out the meritorious nature of your good works. In other words, you can’t store up any treasure in Heaven if your treasure is tainted by pride. This article is from a chapter in Making a Holy Lent. So, what is humility? Here’s a simple rule to keep in mind from St. Teresa of Avila: “Humility is truth.” That is, humility is the moral virtue by which we have an accurate opinion of ourselves, seeing ourselves as God sees us. Humility is the virtue that restrains us in our unruly desire for personal glory and helps us to recognize the fact that there is an infinite distance between the creature and the Creator God, without Whom we are nothing and can do nothing. With Christ as our model, we can say that humility is the self-emptying that allows God to work in us with His grace. The word “humility” comes from the Latin term humus, which means “earth,” “soil,” “dust,” or “dirt.” It reminds us of God’s word to us in the book of Genesis: “You are dust, and to dust you shall return” (Gen. 3:19.) In the spiritual sense, this earthy etymology also reminds us that we are called to cultivate the garden of the soul so that it can bring forth good fruits — that is, good works and development of virtue. Anybody who has done any gardening knows well that you can’t grow anything unless you have the right kind of soil. In the spiritual life, the good soil is always humus — humility. Humility reminds us that every good thing we have and every gift we enjoy come from God and not from within ourselves. The Apostle St. Paul expresses this beautifully in his Second Letter to the Corinthians: “But we have this treasure in earthen vessels, to show that the transcendent power belongs to God and not to us” (2 Cor. 4:7). True humility should not be confused with timidity and mediocrity. True humility does not deny the gifts, talents, and abilities that God has given us. But it does mean that we don’t claim those gifts as our own; rather, we recognize them as having come from God, knowing that He wants and expects and demands that we use those gifts to build up the Body of Christ, the Church, on earth for His greater honor and glory and for the salvation of souls. In my years in the priesthood, I have known people who have a false conception of humility, people who will fall back on false humility as an excuse to do nothing — people who have plenty of time and talent on their hands that they just don’t use. This is a very wrongheaded notion of what it means to serve God in humility. The key point is that the virtue of humility and trust in God go hand in hand. Part of humility, therefore, is being open to God’s plan for us. We are all little in the sight of Almighty God, and without Him we can do nothing. But thanks be to God, He is the One Who makes something out of nothing. Why is pride so dangerous? Because we all want to be somebody. We all want to excel. We all want to stand out from the crowd. We all want the respect and admiration of others. In God’s plan, however, there is only one way to excel and to succeed, and that is to be what God created us to be: saints. That’s what it’s all about. and my spirit rejoices in God my Savior, for he has regarded the low estate of his handmaiden. Mary always acknowledged the great things God had done for Her. She didn’t try to hide it, but rather always gave God the praise and the glory; she always directed everything back to God. Greatness in God’s eyes is not what greatness is in this sight of the world. We know all the things that the world holds in high esteem — wealth, success, status, power, pleasure, fame, physical beauty, athletic prowess — but all those things have no value whatsoever in the eternal view of Almighty God. What you truly are is what you are in the sight of the Lord — nothing more, nothing less. That is reality. Greatness in the sight of Heaven is the perfect fulfillment of God’s Word and God’s Will in your life. No matter how simple or hard it might be, greatness is found in following God’s Will even the most ordinary circumstances of your daily life. That is to say, greatness is holiness, and holiness is the alignment of the human will with the Will of Almighty God. That is how even the littlest, simplest, most hidden, humble soul can be great. And that’s what makes a saint. In your heart of hearts, do you see yourself as being better than others because of who you are, what you have, or what you know? In conversation with others, do you always seem to bring the subject back to yourself? Do you always seem to talk about yourself, your interests, and your affairs? Are you always trying to make yourself look good in the sight of others? Are you always ready to stretch the truth — lie, that is — if that’s what it takes to build yourself up? Do you always have to be right and hate to be contradicted? Do you hold on to your own opinions even when they are proven to be wrong? Do you find it easy to dissent from the teaching of the Church on faith and morals? Are you ultra-sensitive to criticism, and do you struggle to accept even mild fraternal correction? Do you find it easy to gossip? Do you take satisfaction in hearing somebody else being torn down? Do you jump on every chance to point out the faults and the mistakes of others? Do you find it hard to forgive even the slightest offense? Do you always feel a need to get even, and are always ready to hold a grudge? Do you organize your life for the sake of appearances, and do you always feel the need to be noticed? Do you perform your good works in order to win the praise of others, like the Pharisees who preferred the praise of men to the glory of God? Does a lot of this sound familiar to you? Does it strike a nerve? These are the movements of pride. The last question, then, is: How do we grow in the virtue of humility? The first thing to do always is simply to pray for it. The humble soul prays constantly out of radical dependence on God. The Bible says, “The prayer of the humble pierces the clouds, and he will not be consoled until it reaches the Lord” (Sir. 35:17). Second, remember that ordinarily God humbles us through humiliations, which come to us in big and small ways every day. We should accept these moments as permitted by God for our sanctification. Third, we should have a sense of humor — about ourselves most of all. Fourth, we should cultivate joyfulness in our lives. The humble soul is at peace in the hands of God. And finally, most important of all, we must imitate the One Who is the perfect model of humility, Jesus Christ, the Son of God; Jesus, Who said, “Blessed are the poor in spirit, for theirs is the kingdom of heaven” (Matt. 5:3); Jesus, Who humbled Himself to share in our humanity; Jesus, Who taught His disciples to take the lowest place, who washed the feet of the Apostles, who came to serve and not to be served, and who said, “Take my yoke upon you, and learn from me; for I am gentle and lowly in heart” (Matt. 11:29). Jesus Christ, the Eternal Word made Flesh, the Second Person of the Holy Trinity, the King of Kings and Lord of Lords, allowed Himself to be spat upon, abandoned, betrayed, denied, scourged, mocked, and crucified for love of us. For our salvation, He gave Himself up to a shameful public death. That, dear friend, is the humility of God. 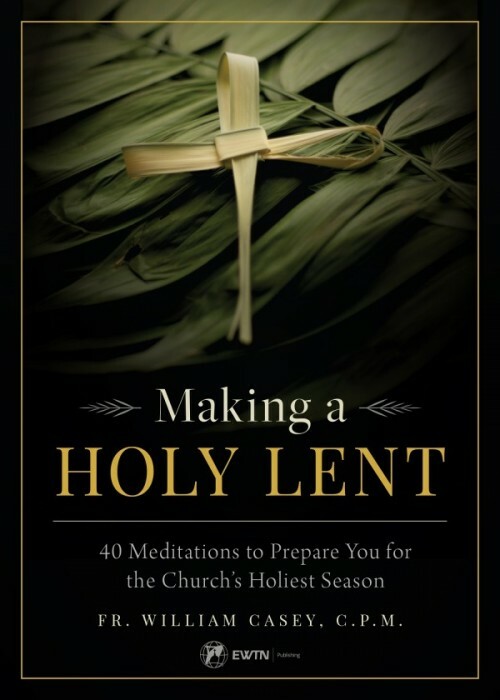 This article is adapted from a chapter in Making a Holy Lent: 40 Meditations to Prepare You for the Church’s Holiest Season. It is available from Sophia Institute Press as a paperback or ebook.